I saw a video a while back on YouTube and now I finally had time to try it. If you want to have a look at Jill Chapman´s video, you find the video here. 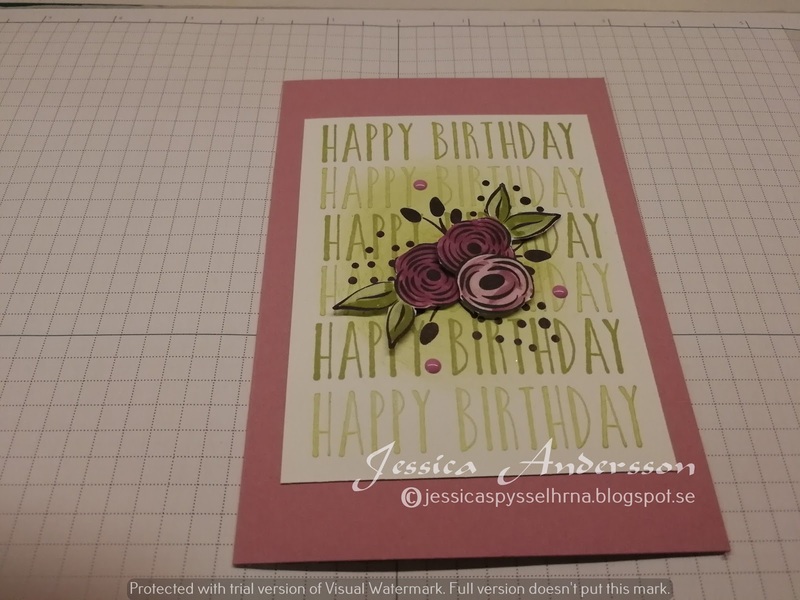 I used the Sweet Sugarplum cardstock as base for my card. I then added a layer of Whisper White cardstock. On the white cardstock I used the happy birthday from the Perennial Birthday stamp set and stamped it first full strength and then again using second generation ink with Pear Pizzazz ink to make my background. I then added som dots and flowers with black in and also added some faded old olive made with a sponge and some Pear Pizzazz ink. I then stamped the flowers and coloured them with my Stampin´markers Rich Razzelberry, Sweet Sugarplum, Old Olive and Pear Pizzazz. I did som fussycut to the flower and them added them with dimensionals and multi purpose glue. Finished the card with som enamel dots in Sweet Sugarplum.